This wire resistance calculator can quickly compute electrical properties of a specific wire - its resistance and conductance. Resistance describes how strongly a given cable opposes the flow of an electric current, and conductance measures a wire's ability to conduct it. There are also two physical quantities associated with them - electrical resistivity and electrical conductivity. After reading the text below you will, for example, learn how you can estimate the resistance of a wire using the resistance formula (so-called Pouillet's Law). Nowadays, one of the most frequently used conductors is copper which can be found almost in every electrical device. Read on if you want to find out what are conductivity of copper and resistivity of copper, and what resistivity units and conductivity units to use. You may also want to calculate the voltage drop on a specific wire - in this case, give our voltage drop calculator a try! Resistivity ρ, unlike resistance, is an intrinsic property of a material. It means that it doesn't matter whether the wire is thick or thin, long or short. The resistivity will always be the same for a specific material, and the resistivity units are "ohm meter" (Ω * m). The higher the resistivity is, the more difficult it is for the current to flow through a wire. You can check our drift velocity calculator to find out how fast is electricity. On the other hand, we have conductivity σ which is strictly related to resistivity. Specifically, it is defined as its inverse: σ = 1 /ρ. As well as resistivity, it is an intrinsic property of the material, but the conductivity units are "siemens per meter" (S / m). Electrical current can smoothly flow through a wire if conductivity is high. In some materials, at very low temperatures, we can observe a phenomenon called superconductivity. Resistivity in a superconductor drops sharply to zero, and thus the conductivity approaches infinity. We can say that it is a perfect conductor. Superconductivity is also connected with levitation, which we have described in our magnetic permeability calculator. A is the cross-sectional area of the wire. L and A keep the same meaning. Have you already computed resistance of your wire? Try our series resistor calculator and parallel resistor calculator to learn how you can calculate equivalent resistance of various electrical circuits. Materials such as copper and aluminum have low levels of resistivity, making these materials ideal for the production of electrical wire and cables. You should remember that resistivity (and therefore conductivity) is affected by temperature. 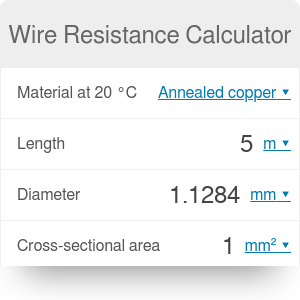 In our wire resistance calculator, we have listed some materials, which you can select to find their resistivity and conductivity at 20°C. For example, the electrical conductivity of copper is σ ≈ 5.95 * 10^7 S / m and the electrical resistivity of copper is ρ ≈ 1.68 * 10^(-8) Ω * m.
Wire Resistance Calculator can be embedded on your website to enrich the content you wrote and make it easier for your visitors to understand your message.